Welcome to Biddeford+Saco, a true Vacationland spot offering miles of white sandy beaches and countless outdoor activities. Here you can enjoy biking, boating, hiking, kayaking, fishing, golfing, and abundant cultural activities. To start with, we encourage you to visit the beautiful and unique Ferry Beach State Park during your stay. We are home to some of the most fun family amusement and water parks in the Northeast. Funtown Splashtown USA is the largest amusement and water park in the state. Biddeford+Saco also offer Maine’s only IMAX movie theater and a classic drive-in theater. A walk along our streets will give visitors the chance to take in the historical significance of our community, a feeling preserved in the architecture on our main streets, and in the homes and rows of historical brick factory buildings that line the Saco River separating our towns. Visit our museums, historical society, and theCity Theater—considered one of the most acoustically perfect in all of Maine. Be sure to include a visit to our specialty shops featuring everything from fine foods to home décor. The Shops at Biddeford Crossing and Saco Valley Shopping Center feature your favorite larger retail chains, groceries, and a wonderful bookstore. When it comes time to eat, our restaurants are second to none and our clean, comfortable, and surprisingly affordable accommodations will make your stay all that much more pleasant. Biddeford beaches include Biddeford Pool—a large tidal pool with a two-mile stretch of sandy beach. Fortunes Rocks boasts a wall of rock then sandy beach and great surf. Hills Beach has nearly 500 yards of sand. In Saco, Kinney Shores and Bay View are welcoming and family-friendly; Camp Ellis and Ferry Beach mark the southern tip of a seven-mile stretch of beaches. Looking for something serene? Try paddling or taking a spectacular cruise on the Saco River or ocean kayaking, boating, or sailing in Saco Bay. 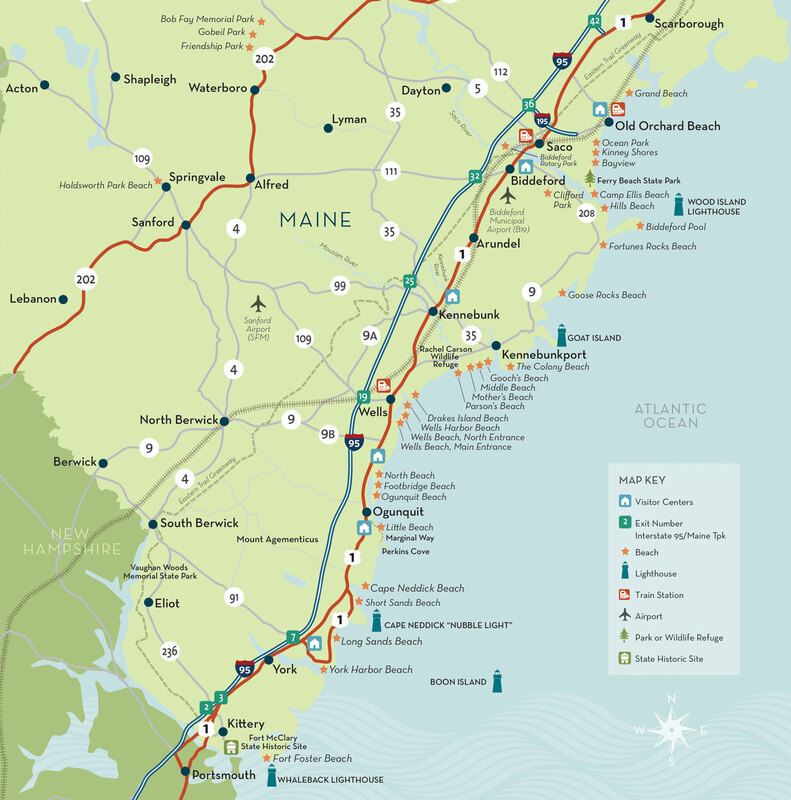 Our area is easily reached via the Maine Turnpike, US Route 1 or the Amtrak Downeaster, and by air into Biddeford Municipal Airport or via commercial flights into the Portland Jetport just up the road. We hope you choose to visit us and will return again and again once you see all Biddeford+Saco has to offer.